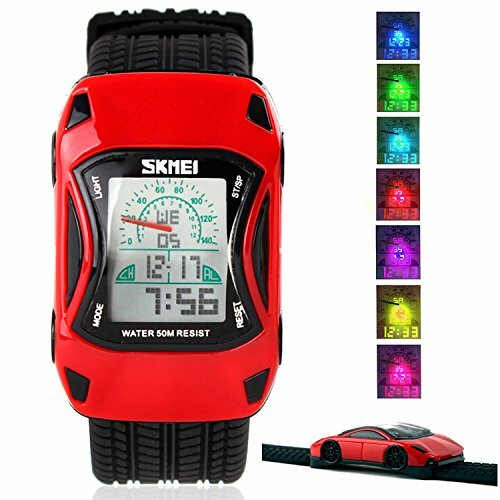 Multi Functional Kids Digital Watch: 7 Colors Led Back Light, Chronograph, Stop Watch Timer, Alarm, These Functions Make This Boys Digital Watch Suitable For All Kinds Of Indoor And Outdoor Sports Use. HIGHLY TRANSPARENT RESIN GLASS: The glass is made from the highly clear resin material imported abroad and sealed with the kids watch case by high frequency machine. So that the glass is extremely hard and pressure-tolerant. WATERPROOF FOR DAILY USE: 50M Water Resistant, HANDWASH, SWIMMING, NO PROBLEM ! Feel free to wear the digital stopwatch when children are showering, swimming and diving. NOTE: Please DO NOT press any buttons in the water or wear this watch for longtime underwater activities - such as diving, ect. Too much water contact or usage in extreme Hot or Cold temperature will shorter watch life. If you have any questions about this product by Etway, contact us by completing and submitting the form below. If you are looking for a specif part number, please include it with your message.